When: Thursday, April 3, and Friday, April 4, 8 p.m. Admission: students and seniors $15, general $20; available at the UBC Bookstore, Rotary Centre for the Arts, and at the door. UBC’s Theatre 26 and the Faculty of Creative and Critical Studies presents Spent, a fast-paced, satirical commentary on the greed that caused the 2008 financial crisis. Spent arrives in the Okanagan after a Dora Award-winning run in Toronto and sold-out run at the 2011 Edinburgh Fringe. Conjuring the madness of the 2008 economic downturn, the comedic duo Ravi Jain and Adam Paolozza spare no one, impersonating suicidal traders, BBC World News commentators, those who lost everything and especially the Wall Street white-collar crooks that took your money! Inspired by the techniques of silent film where humour, slapstick and pathos come together in the most imaginative way, Spent will make you think and make you laugh – all the way to the bank. Spent plays Thursday, April 3, and Friday, April 4, 8 p.m., at the Rotary Centre for the Arts, 421 Cawston Ave., Kelowna. Admission is $15 students/seniors, and $20 for others. Tickets are available at the Rotary Centre and UBC Bookstore. 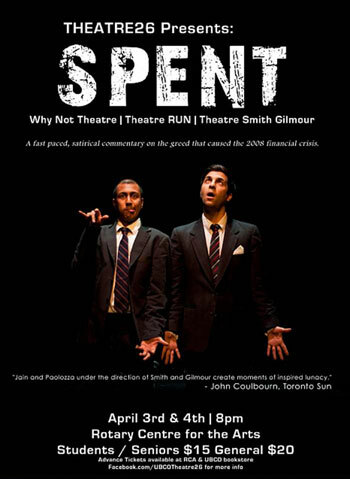 Spent is a co-production of three innovative Toronto independent theatre companies, Theatre Smith-Gilmour, Theatre RUN and Why Not Theatre. Spent is written by Dean Gilmour, Michele Smith, Ravi Jain and Adam Paolozza; directed by Dean Gilmour and Michele Smith; performed by Ravi Jain and Adam Paolozza; lighting and stage management by Andre Du Toit.